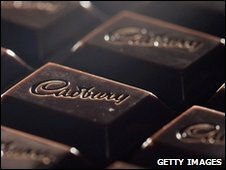 US firm Kraft Foods has sealed its takeover of Cadbury after shareholders in the UK chocolate maker voted in favour of the deal. Cadbury said it had received valid acceptances of the offer from investors representing 71.7% of the firm. Kraft chief executive Irene Rosenfeld said: "I warmly welcome Cadbury employees into the Kraft Foods family." 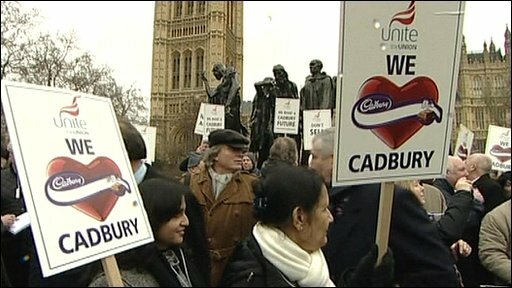 Earlier, Cadbury workers had staged protests in London calling for government support to guarantee jobs. The deadline for Cadbury shareholders to accept a £11.5bn ($18.9bn) offer from Kraft was 1300 GMT. Business Secretary Lord Mandelson will meet Ms Rosenfeld later to discuss jobs. Shadow business secretary Ken Clarke was also holding talks with Ms Rosenfeld over Cadbury's future. When Kraft passes the 75% threshold it intends to take Cadbury off the stock market. When it reaches 90% support, under UK law, it can automatically buy up the remaining shares. "The combination of Kraft Foods and Cadbury creates a global powerhouse in snacks, confectionery and quick meals," said Ms Rosenfeld. "Together we have impressive global reach and an unrivalled portfolio of iconic brands, with tremendous growth potential. "This combined company has a phenomenal future, and I firmly believe it will deliver outstanding returns to our shareholders." But earlier, unions voiced their fears over the takeover. 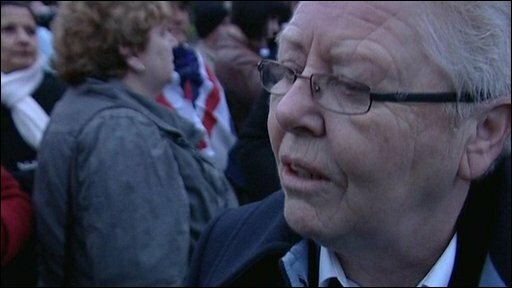 Unite's deputy general secretary Jack Dromey said: "Our fear is that the Kraft takeover is not in the national interest, and in the months of this hostile takeover process, we have heard nothing from Kraft to calm fears that it is in the interest of the Cadbury workforce either. "Instead, the fate of manufacturing workers in Terry's of York, who found that Kraft ownership saw their plant close, weighs heavily on the minds of the Cadbury workforce." He added: "The government must secure meaningful pledges from Kraft, and police them so that Kraft cannot again walk away from a UK workforce. "Ministers must make it abundantly clear that closures and mass redundancies will not be accepted by the British government or the British people." Last month, Unite warned shareholders of the British chocolate-maker that Kraft's debts, estimated to be about £22bn, meant there could be an "irresistible imperative" to reduce costs by cutting jobs. Unions fear Kraft will move quickly to recoup the expenditure by slashing jobs and have demanded an urgent meeting with Kraft's global management.